WHENEVER AN invite lands in your inbox to attend anything to do with Black Motion, you blink not and gracefully honour the invitation. Last night the duo launched their company Spirit Motion label at the very intimate Marabi Restaurant, New Doornfontein-Jozi. 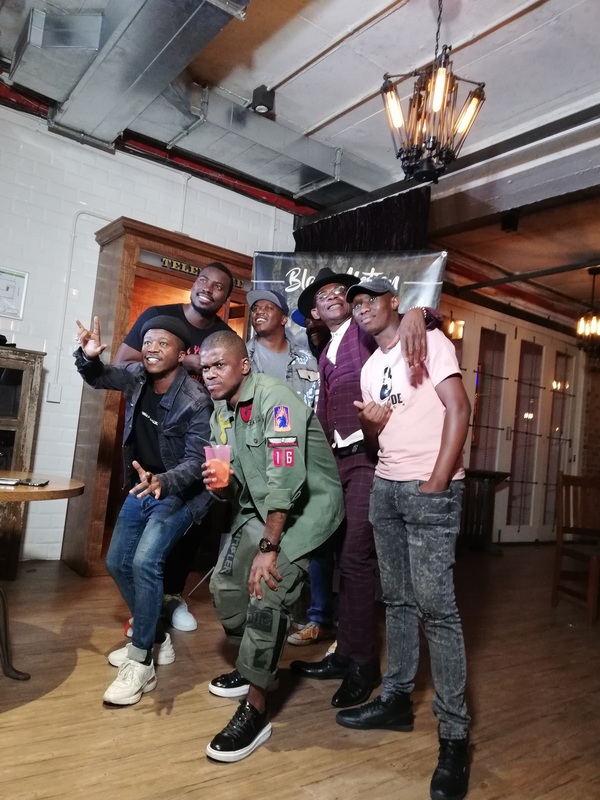 Spirit Motion label founders and Black Motion stars Smol and DJ Murder, Cairo, Cacharel Jiaoo (maroon suit) and G-Washington at the launch held at Marabi Restaurant, New Doornfontein. Image SLM. Led by Smol and DJ Murder (Thabo Mabogwane and Bongani Mohosana) who confessed during the launch that they’re Sepedi speaking and believe in ancestors hence their latest offering Moya Wa Taola, that also reverberated all night long. According to Thabo the “album was also influenced by the Royal family King of Bapedi, whom we honour and respect”. “Some of the songs are dedicated to the King and his subjects and we hope the album will be appreciated by all, he said. In my culture we beat the ‘hell’ out of drums, hence Moya Wa Taola as our latest release, gloated Thabo with a tinge of a smile. Sprit Motion label comprise of Brenden Praise, Miss P, Cairo and Cacharel Jiaoo from the DRC, who kept guests on their toes with his vibey moves. Asked how came to meet the duo, Cacharel admitted that it was through one of the producers who met them during their tour. “Because I’m always touring between SA and DRC, we made time to meet and that resulted in going to the studio to record a song that is featured in their latest album. For me it was easy because I love this country hence we connected with the guys from the word go,” says Cacharel in your typical flamboyant American suite. Moses Mokgoko who partnered with Black Motion to form Spirit Motion, says their prime objective is not to sign too many artists to avoid the drama other emerging labels are experiencing. Godrey Hlapa aka G-Washington, a DJ and an academic who works in the national Government says for him will be to guide the youngsters and steer them in the right direction. On the controversial bookings that had the tongue-wagging in the industry with Mo Flava (MetroFM) Thabo indicated and confirmed all has been sorted out. In true Black Motion style, they rounded the evening with performances from their stable mates and Nokwazi. They also went down memory lanes by belting out hits after hits as far back as 2010- as they drummed like demons possessed- meropa le merethetho… oh, what a night. Currently, Back Motion is signed under Sony Music SA.